We are a leading Exporter of duct heaters and air duct heaters from Hyderabad, India. We are manufacturers of a complete line of electric Duct Heaters with various physical sizes and kw/btu/h outputs. 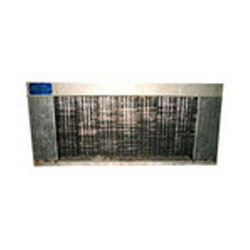 They mainly are used to boost air temperature for any forced air system. The offered range is used in injecting blow molding, packaging industry, thermoforming equipment and other instant heating applications. Clients can avail the offered heaters from us at market leading prices. Ground source heat pump boost / backup. Air Duct Heaters are constructed out of variety of tubular Heater combinations & inner mountings. While Duct heaters are easily adaptable to many non-pressurized, air-heating systems, they also offer several advantages over gas or oil fired and open coil electric heating units. In order to meet clients’ mottled needs, we offer these air duct heaters at nominal prices. Offered air duct heaters can also be modified as per the stipulations of our clients.